Loosely cover the frozen bread dough with plastic wrap. Allow dough to thaw for a few hours at room temperature. Roll dough out to approximately 11 x 11 square. One frozen dough log makes one pepperoni roll. Brush dough with olive oil or whatever cooking oil you prefer. Lay pepperoni on dough covering entire surface. I like to use sandwich pepperoni from the deli. Sprinkle with shredded mozzarella cheese. Next, sprinkle with shredded Parmesan cheese. You can use grated from a can if that is what you already have on hand...but you can buy the shredded Parmesan in a bag.You'll find it right next to the other bags of shredded cheese. Wal Mart sells it for $1.99 and it is very good. I like using the shredded Parmesan in the bag because the flavor is so much better! Lightly sprinkle with Italian herbs...basically, some dried oregano, parsley and basil. Be careful, not too much....oregano can be very strong and you don't want too much! Add a sprinkling of garlic powder. I was all out of garlic powder, so I used garlic salt. Roll up dough starting at one edge of square. Place rolls on baking sheet, leaving space between. Brush some melted butter on top of uncooked pepperoni roll. You do not need to let rise. Bake it right away. It will rise up in the oven perfectly. Bake at 375 degrees for approx. 15 to 25 minutes. Oven temps. and times may vary. When done, top of roll should be golden brown and you should be able to make a tapping sound on the crust with your fingernail...just the same as when baking bread. 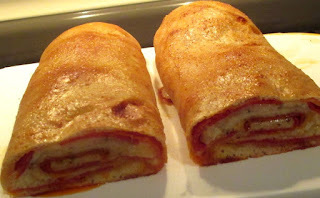 Make sure you allow pepperoni roll to cool completely before serving.